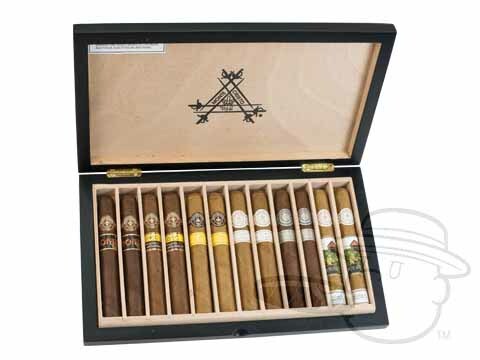 The Montecristo Toro 12 Cigar Sampler is tagged with free shipping. If you order this product, your entire order will receive FREE BCP Ship Saver shipping! The Montecristo Toro 12 Cigar Sampler showcases two cigars each of the Cuban heritage brand's most coveted blends. Beautifully packaged in a collectible Montecristo display box, this elegant and affordable sampler is the ultimate gift selection for any Montecristo fan, or any fan of fine cigars in general. My wife got me this sampler and a stainless steel cigar cutter for our 8th wedding anniversary. Was I surprised? Yes. Was I pleased? Hell yes! thanks to BCP for recommending this to her. 20+ years smoking cigars and still have yet to find a better line than Montecristo. Good sampling here, not one dud in this box. It was so smooth and the flavor was just so good that I wanted more. This was a great gift. The cigar were a little harsh compared to what I'm used to smoking but still really good. Second time ordering this sampler pack. Great smokes, great value! Montecristo Toro 12 Cigar Sampler is rated 4.7 out of 5 based on 9 customer ratings.